Though the five-episode mini-season of Doctor Who that ends with "The Angels Take Manhattan" (but more importantly, will they take Berlin?) has had a few bright shining moments, it's largely felt like it was laying the groundwork for future stories rather than focusing on those being told in the present. Appropriate given the nature of the show, perhaps, but it hasn't made for the most satisfying run of episodes. After last season established that The Doctor was hitting the reset button on himself to counteract the way in which he had become "too big" - a criticism that could also have been levelled at the show itself - these episodes had to show what the ramifications of that might be. As River revealed in this episode, in addition to wiping The Daleks' memories of him from their collective database in "Asylum of The Daleks", The Doctor has been removing himself from every information source in the galaxy so that he will be able to operate under the radar again. It's that freedom that allows him to sit in Central Park with Amy and Rory, reading detective fiction and drinking coffee. Of course, trouble always finds The Doctor, and soon a Weeping Angel zaps Rory back to 1938. Even as the show has been setting up its brave new universe for The Doctor, it's also spent much of the last four episodes wrapping up the story of Amy Pond. When Steven Moffat took over the show following the departure of Russell T. Davies, Amy acted as both the new companion and as a way of introducing version of the show, a version heavy on fairytale imagery and a grander meta-narrative indelibly tied into the story of a little girl waiting for a man in a blue box to come and take her away. That resolution reached its natural and welcome catharsis here, but the way in which everything worked so well in this episode highlighted just how problematic the ones leading up to it have been. In retrospect, the build-up to The Ponds' exit was so minimal that it felt as if this episode could have been aired as the Christmas Special or a standalone television movie without losing anything of any real substance by dropping the others. Even though this was an immensely strong and effective finale for the characters, it didn't feel like a culmination of the episodes leading up to it so much as it felt like pay-off from "The Eleventh Hour", the episode that introduced them several years ago. This episode underlined just how little happened in the ones before it, and how unnecessary they were in order to give Amy and Rory a decent send-off. Everything that needed to be said could have been, and largely was said in this single episode, which makes the other four seem kind of flimsy. Mere prelude to everything that happened in this episode. But that's enough of the big picture, let's zoom in a little bit. Since they were introduced in All-Time Classic Episode "Blink", The Weeping Angels have proved to be one of the revived series' more unforgettable images. They've also suffered from a terrible case of diminishing returns as the show moved away from the iconic image of them as static, implacable monsters, even showing them moving around like a bunch of crappy mime artists at one point. In that respect, "The Angels Take Manhattan" marked a return to form by depicting them in creepy tableaux, chasing people by appearing and re-appearing every time someone blinks or the light fails, until they eventually catch their prey. Though the tricks employed were exactly the same as those used in "Blink", they're still effective and incredibly creepy, so any scene in which the Angels 'chased' people worked very, very well. As well as recalling the creepy side of "Blink" to great effect, Steven Moffat also brought back the emotional power of the Angels by showing how they 'kill' people: by sending them back in time, essentially dooming them to live out an existence outside of their original timeline. This was played for jump scares in the cold open, which show a Private Detective discovering his old self in an empty hotel moments before he is caught by The Statue of Liberty, who was revealed to be a giant Angel, but it also formed the emotional core of the episode when Amy, having managed to track down her Rory in the 1930s, meets an elderly version of Rory who promptly dies. This introduced some fairly hefty thematic concerns to the episode regarding free will and determinism: by witnessing Rory die old and alone, she learns two things; that the Angels are going to take him, and that he lived a life without her. This tapped into the relationship between Amy and Rory beautifully, reaffirming the love between them that transcended millennia. How could Amy just let The Angels take away the man who waited 2000 years for her? The answer, of course, is that she couldn't, and here was where Moffat managed to seamlessly make plot, emotion and character one, a trick that the show has struggled to pull off lately. Amy's not prepared to let her man be taken from her, so she seizes upon a plan. 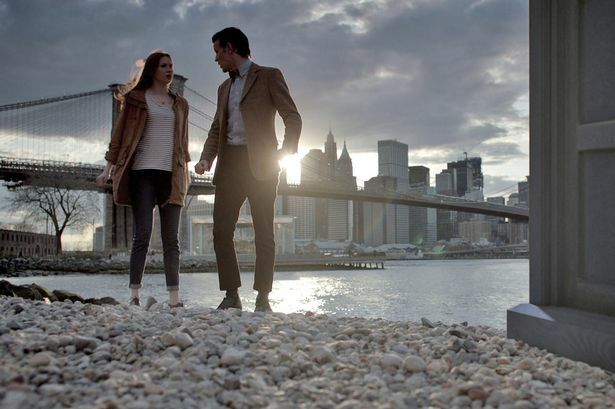 In order to defeat The Angels, who have turned New York into their own personal feeding ground, the Doctor and Amy have to prevent them from getting Rory. By doing so, they will create a paradox since Rory will have never grown old and died alone as The Doctor, Amy and River (oh yeah, River is in this episode, though she's kind of not that important) saw happen. The paradox would destroy The Angels, and everything would be hunky dory. Or at least as hunky dory as living your life in perpetual fear of being chased by creepy stone Angels can be. This then lead to the second big emotional moment of the episode. As Amy and Rory try to escape the Angels, they find themselves trapped on the roof of the Angel's hotel/home. With nowhere to go, Rory sees a way out; if he throws himself off the building, he will die there and then, rather than as an old man, creating the paradox that is so essential to defeating the Angels. After asking Amy to help him because he isn't strong enough on his own, the two decide to jump together, hopeful that they will come back to life once the paradox takes effect, and certain that if it doesn't work, at least they will spend their last moments together. Fortunately it does work, and everyone winds up in a graveyard somewhere outside of New York, next to a gravestone which bears Rory's name. Here's where Moffat genuinely surprised me and delivered an exit for the Ponds which was heartrending without being too soppy. Right after Rory sees the gravestone, he disappears. An Angel survived the paradox and so sent him back in time. Unfortunately, the time energy created by the paradox stops the TARDIS from returning there, meaning that Rory is lost forever. Faced with this, Amy makes a final, fatal choice; she decides to follow him into the past. After a brief goodbye to The Doctor and her daughter, she takes one step forward and disappears from The Doctor's life forever. Again, Moffat makes good on the relationship that he so carefully built up between Amy and Rory, making her decision feel right, even if by doing so she broke The Doctor's heart(s). She leaves him a final note in the afterword of a book, letting him know that she and Rory lived long and happy lives together, but that can be scant condolence to the Timelord, a man who spends so much of his time trying to save people who now finds himself irrevocably separated from two of the most important people in his life. In all these scenes, which required a lot of them, Matt Smith, Karen Gillan and Arthur Darvill did very fine work - the latter especially so, considering he was buried under old man makeup for one scene - and they really sold the emotion amidst the science fiction. It's a strong, poignant end to a run of episodes which was, for the most part, entertaining, but wound up lacking the gravitas that the end of an era requires. Because however much The Doctor might hate endings, this was most definitely one. Moffat's time as showrunner has been inextricably tied to the story of Amy and The Doctor, and even though the show has seen several companions go since coming back - not to mention the dozens from the pre-revival years - this one ranks up their with Rose's exit as being one of the most momentous. The show will go on, as will The Doctor, but both will be different for the experience, and whilst this episode achieved everything that such a moment requires, it left me wondering why we had to wait so long for it to happen. Still, after so much table-setting, it was great to finally sample the meal and discover that it was pretty great. Despite my issues with these last few episodes, I am still massively invested in this show and hugely excited to see what happens now that the Pond years have been left behind, and Moffat and his team can venture forth into new and exciting territory with new companions and a Doctor who is ready to get out there and start making new enemies. Christmas should hopefully be very special this year. - I liked the New York setting for this episode, primarily because it didn't feel as if they show was pandering to the American audience. It was the backdrop to the episode and there were some familiar sights along the way, but it didn't get distracted by the setting as badly as it could have. - Still not sure if the idea of The Statue of Liberty as a giant Weeping Angel was funny or immensely stupid. - I watched this episode immediately after seeing Rian Johnson's Looper. The two make for oddly complementary works. - It makes me really sad to see that Amy outlives Rory by five years (judging by the gravestones at the end). She travels back through time to be with him, and she still ends up watching him die again. - As ever, it's been great writing about this show, even if this batch of episodes wasn't the strongest it has ever put out. I can't wait to see what happens at Christmas and we finally get to meet the new companion properly. Hopefully I will see you all there. If you are interested in Doctor Who but you haven't seen it from the beginning, or you would just like to start it all again, then why not watch tv online with LOVEFiLM, who provide all the series on instant streaming?